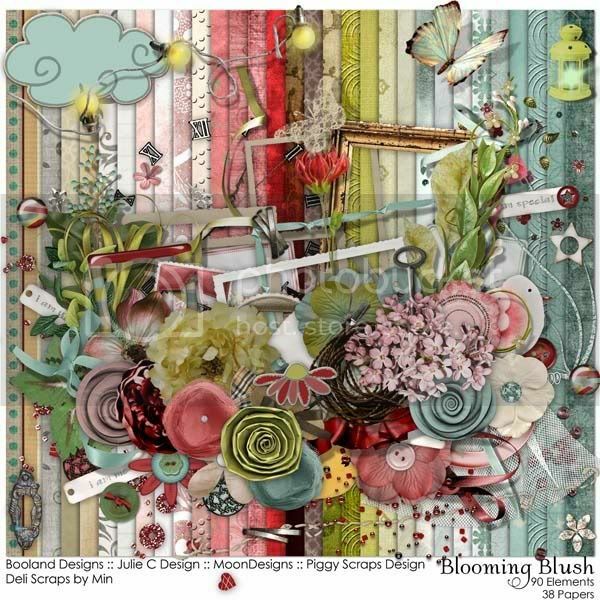 Today I want to show you a wonderful new collab – Blooming Blush. It is the perfect spring kit for those of us who like a touch of subtlety, vintage, heritage and a refreshing splash of color. With Blush you can scrap those gorgeous sunset pics this spring and summer and truly let them shine, the colors complement almost any layout. Blush was created by the combined talents of BooLand Designs, Deli Scraps, Julie C., Moon Designs and Piggy Scraps Design. For a limited time you can get this great collab kit for 33 % off! !